What do you do when flood waters have invaded your roomy property? You get on your quad bike, strap a wakeboard on the back and get surfing. 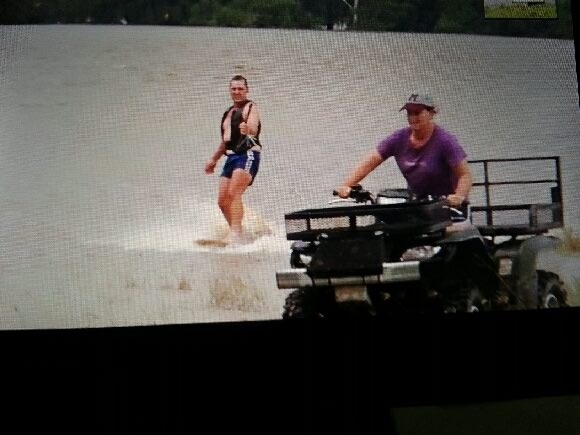 This picture shows Michaela Yore, sister of Ikon Brisbane’s client services director Sharon Clarke, and her husband making the most of the swollen Logan River. Yore lives on a 500 acre property at Cedar Grove through which the Logan River winds its way through. Australian magazine queen Deborah Thomas will tonight launch Kirstie Clements’ much anticipated book, The Vogue Factor, at a Champagne-studded celebration in Surry Hills. Thomas, whose list of high-profile roles include Bauer Media’s current head of brand development and public affairs, a judge on Celebrity Apprentice, local councillor for the suburb of Woollahra and former editor of the Australian Women’s Weekly, is also a long time friend of the ex-Vogue editor. Following her blunt dismissal from NewsLifeMedia in May last year, after a career spanning 25 years and 13 as editor of Vogue, Clements tells the story behind the headlines, and takes us behind the scenes of a fast changing industry. “From her humble beginnings growing up in the Sutherland Shire in Sydney to her brilliant career as a passionate and fierce custodian of the world’s most famous luxury magazine brand, Clements lifts the lid on her Vogue world, a universe that brims with dazzling celebrities, fabulous lunches, exotic locales and of course, outrageous fashion,” a media release from Melbourne University Publishing said today. Guests will sip on Moët Chandon and Belvedere vodka cocktails while getting their copies signed at Surry Hills’ Japanese restaurant, Toko, from 5:30pm onwards. The Networker is on tour for the next couple of weeks and will be bringing you some of his favourite ads from the US of A.
Let’s start off keeping the flavour distinctly Australian, or at least an American company’s use a political punchball the NBN for a little promotional activity. The Networker wonders whether the creatives bbehind the new BlackBerry Super Bowl spot are scrambling to reshoot it based on the insporation from these versions of it. Whilst one is definitely zeitgeist the other has more BlackBerry potential, given the peculiar ‘Wake Up’ teaser campaign last year. Katie Rigg-Smith is set to take on the top job at GroupM agency Mindshare after yesterday’s resignation of James Greet. She will be the only current female head of a media agency in Austrlia, currently holding the role of chief strategy officer at the agency, which she has been with for 14 years since joining as a graduate trainee. Greet announced yesterday he is set to join rival Ikon in July, after three years at the helm of Mindshare. The agency has also confirmed today Sharb Farjami has been lifted to the role of chief operating officer for the Australasian division. Radio station 2DayFM has been knocked off its pedestal as ratings drops in the important breakfast and drive slots sees WSFM take the coveted title as Sydney’s number one FM station. Australian Radio Network’s WSFM now rules the market with 8.5% as rival 2DayFM’s overall Monday to Sunday audience share slides from 9.3% to 8.4%. Driving 2DayFm’s loss was a 1.8% drop in the drive slot which is led by Fifi & Jules Tuesday to Friday and Hamish & Andy on Monday’s. The drop has seen the station lose its number one spot in drive to 2GB. The Kyle & Jackie O Breakfast was also dealt a slight audience dip of 0.8%, however the duo continue to lead with a 10.2% share. Nova 96.9’s breakfast duo have added half a point, growing their share of Sydney’s breakfast audience to 6.8% in the latest Nielsen radio ratings survey. 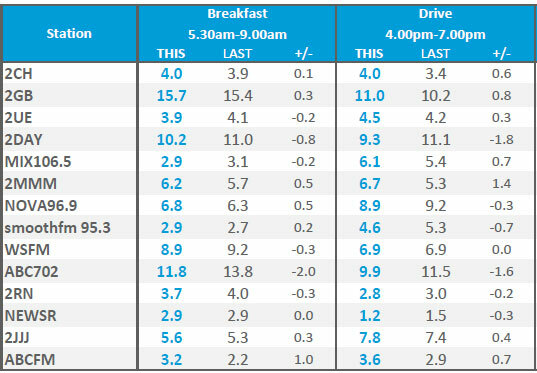 Meanwhile, talk station 2GB has maintained its grip on breakfast with a 15.7% share and regained number one spot in drive after adding 0.8 points to hit 11%. 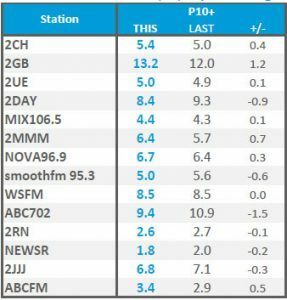 2GB also continues to dominate the Sydney radio market with an overall share of 13.2% after adding 1.2% on the previous survey result. The good times continued for ARN in Melbourne where Gold 104.3 added 1.7 points to its overall share to overtake DMG Radio Australia’s Nova 100. The jump has seen Gold narrow the gap between itself and Melbourne’s number one FM station, Southern Cross Austereo’s Fox Fm, to just half a point. Gold’s growth was driven out of breakfast where it jumped 1.6 points to take a 6.9% share. In drive the station added 1 point to claim a share of 8.1% putting it above fellow ARN station Mix 101.1. Mix 101 dropped slightly in both breakfast and drive, by 0.6 and 0.3 points respectively. 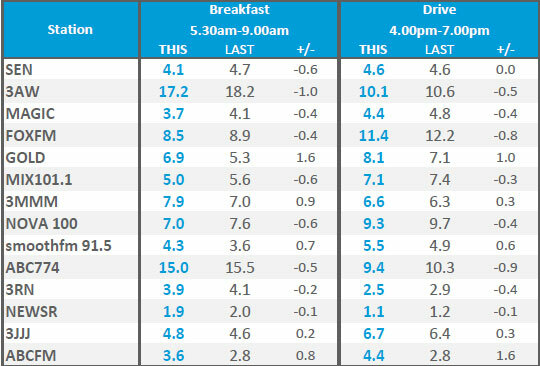 DMG’s smoothfm performed better again in Melbourne than it did in Sydney, this time growing by 0.7 points in breakfast and 0.6 in drive. 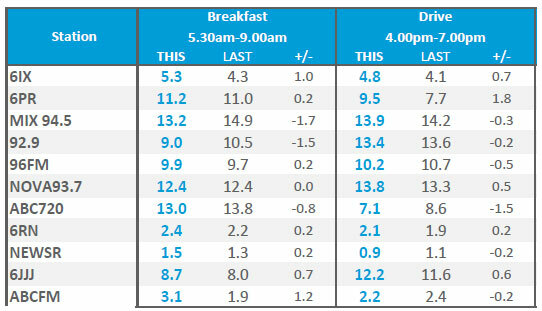 Southern Cross Austereo’s Triple M overtook Nova 100 in breakfast after posting audience growth of just under one point. 3AW ratings have continued to drop in the second survey of the year. The talk station shed 1.1 points in Monday to Sunday, one point in breakfast and half a point in drive. 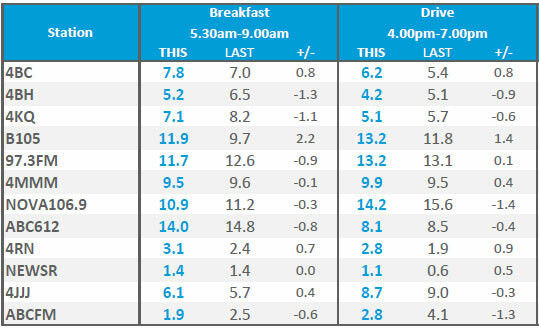 In the previous survey 3AW suffered a 1.2 drop in breakfast and a massive 2.1 point decline in drive. In Brisbane SCA’s B105 was the success story as it jumped 1.8 points to take an overall share of 11.6% and is now chasing FM runner-up Nova 106.9. B105 has moved from third place in breakfast to first after adding 2.2 points to take 11.9%. 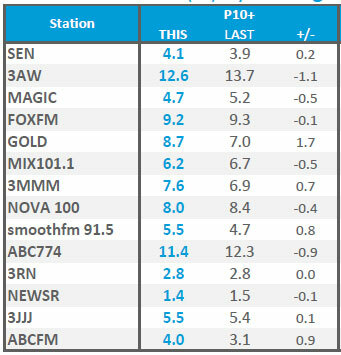 The growth puts the station ahead of ARN’s 97.3FM (11.7%), Nova (10.9%) and Triple M (9.5%). 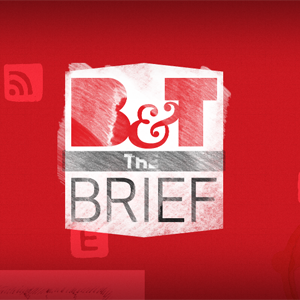 In drive B105 is now neck-to-neck with 97.3FM with both sitting on 13.2%. There were both highs and lows for Adelaide radio stations as the latest ratings survey. Overall, the most growth was recorded by Triple M which added 1.1 points to its Monday to Sunday share to overtake Nova 91.9 and SAFM. The largest overall loss was felt by Mix 102.3 which shed 2 points to come down to 14.8%. In the important breakfast slot Mix lost 1.7 points and handed first place to talk station Fiveaa which also lost one point. SAFM added 1.2 points to its share of breakfast listeners to take 8.8% and has overtaken Nova (8%). Fiveaa continues to lead drive despite a 2.5 point drop to 13.5%. Mix 102.3 lost 1.6 points which reduced its share to 13.1%. The drop has narrowed the gap between Mix and competitor SAFM (12.2%). Triple M recorded the slots most growth of 2.2 points. 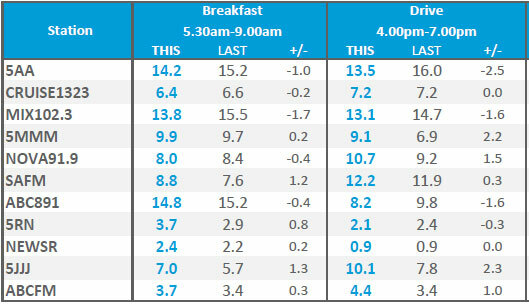 In Perth’s tight radio market Mix 94.5 continues to dominate breakfast despite suffering a drop of 1.7 points. The decline has seen the Nova 93.7, which remained steady on 12.4%, sneak up on Mix. SCA’s 92.9 dropped 1.5 points to fall out of the top four breakfast shows to be replaced by 96FM. The competition is now even tighter in drive as three stations, Mix, 92.9 and Nova, now all sit between 13% and 14%. Slot leader Mix dropped slightly to 13.9% while runner up 92.9 fell to 13.4% to be replaced by Nova in second place with a share of 13.8% after adding half a point. 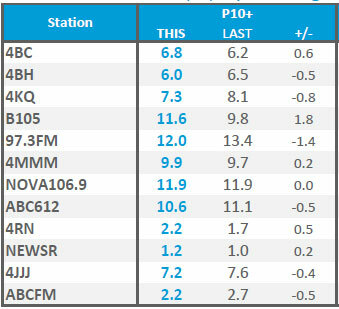 Talk station 6PR added 1.8 points in drive, the growth pushing the station’s overall Monday to Sunday audience increase of 1 point. Every week Naked Communications’ strategist Lach Hall scours the web for all things digital, quirky and innovative and presents it in bite-sized chunks for Digital Degustation. In an effort to petition the Australian government to fund more clinical trials for Duchenne Muscular Dystrophy, The Duchenne Foundation and Save Our Sons have created “The Most Powerful Arm Ever Invented” – a live-streamed, petition-signing robot. Pledge your support by connecting with Facebook and the robot hand signs your Facebook name to the mass petition, snaps a photo then automatically posts it to your Facebook wall. The New York Times has created an automatic haiku detector in another move that shows the innovative side of their tech department. ‘The Haiku Bot’ scans the front page of the New York Times for sentence fragments that unintentionally form a haiku structure. Once found, they’re published on the Haiku Tumblr and exceptional non sequiturs are shared on the New York Times Twitter account. For more on this click here. It’s difficult to pry kids away from screens these days to play with old-fashioned toys. However, a group of Miami Ad School students have come up with a brilliant idea that combines the two. Lego Storybuilder is an app concept where the game story requires kids to build elements with Lego off screen to complete missions and progress to the next stage on screen. To see the video click here. The digital era is a terrible time to be a criminal. In the past, an unidentified criminal caught on CCTV would need to be identified via the likes of a hit and miss public broadcast. Now police in New York have facial recognition technology that can take the same image and search for a match on Instagram, Twitter and Facebook, making identification much more efficient. For more on this topic please click here.